Okra has made its foray into our culinary repertoire. I was suspect at first but it won me over. After bringing some home about a month ago to experiment and see if we could use it to thicken soups and stews instead of corn starch, we quickly found it worked wonderfully and we hoped we could stock up for the winter. Thankfully, okra grows like mad and my friend with the 2 acre garden is happy to share with others. (Thanks Phyllis!) She and I picked for a little over an hour a couple of weeks ago and I brought home this armload. It took me about an hour to wash it all, and all our counter space to lay it out to dry. I was worn out from all the picking and washing that day! 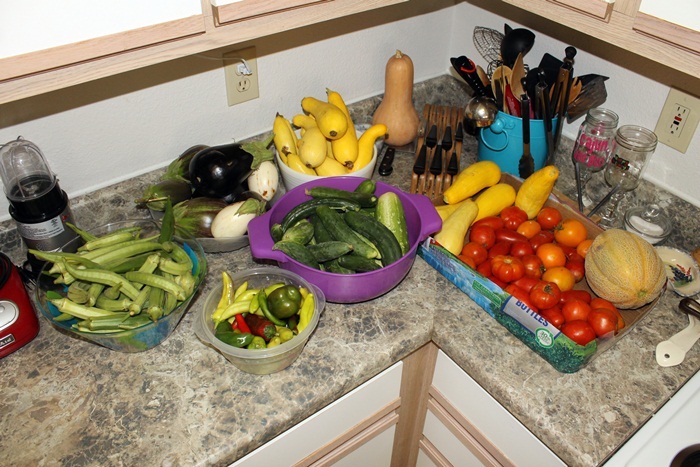 Here’s another look at half of the haul a day or two later just before blanching. 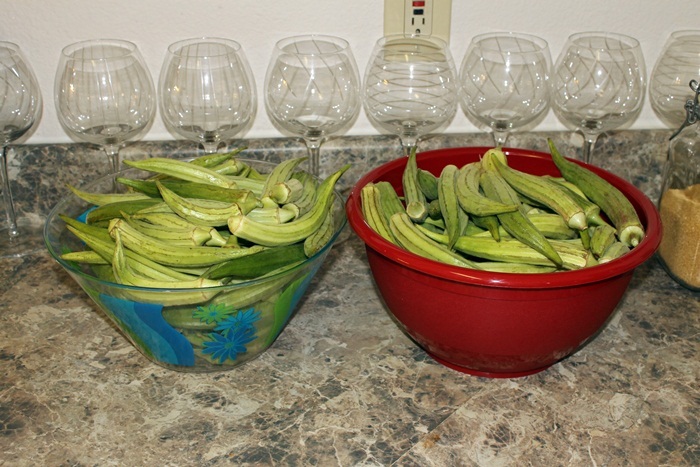 It took two days and 1-2 hours each day to cut, blanch, cool, bag, seal, and label all the okra. But it’s totally worth it. The process for blanching is pretty simple. Essentially boil your vegetable for a short period, cool it in an ice bath, and freeze. 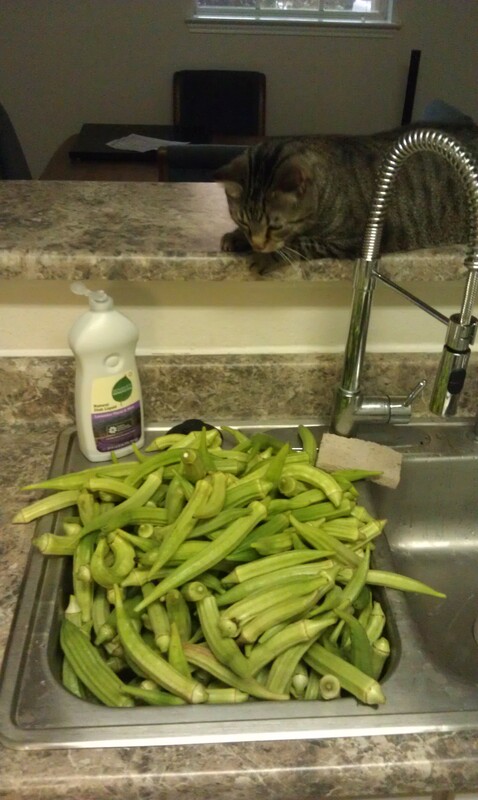 However, I have found that with okra, folks tend to tackle it many, different, ways, many choosing to blanch it whole. We like to cut it into pieces which helps remove some of the “slime” that can be both a blessing or a curse. It’s the slime that helps our dishes thicken but I don’t want too much slime. Truly, I don’t really want to notice it at all. So this is our method which may not be traditional but seems to be working just fine for us. After boiling, the okra needs to cool before bagging and freezing. Again, when I blanched the eggplant recently, I cooled it in an ice bath, per instructions I’d read online. Don just dumped the okra into the biggest strainer we had and let it cool as it was. It took 30-45 minutes to cool so much at once and then we bagged and sealed. I don’t know if it was a matter of convenience or whether Don just forgot the ice bath part. But like I said, it doesn’t seem to have caused any problems. 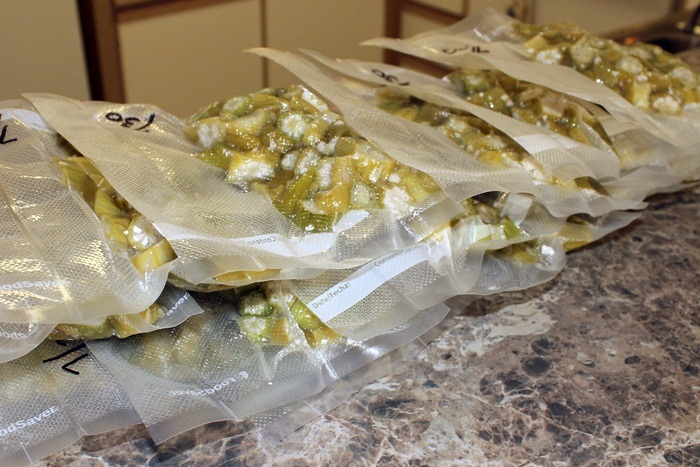 In the end, our hard work resulted in 16 packages of okra (about 1 cup in each package) weighing just under 1/2 lb each – that’s about 7 lbs of okra! Oh my! TIP: The other trick for reducing the slime factor is to let your dish – soup/stew/chili – cook long and slow, allowing the okra to break down considerably; most easily done with a crock pot.